Although fat cats seem to be everywhere, underweight cats are at equal health risk. If your cat doesn’t seem to be able to gain weight they may be overly active, have parasites, or they might be small. To help your cat healthily gain weight, look at our top 5 cat foods for weight gain! Unfortunately, cat’s that are underweight usually have another underlying health issues that’s led to them being underweight. It’s always a good idea to visit your fur baby’s veterinarian before making any major decisions about their weight gain! It might seem like these 2 would go hand-in-hand, but high calorie and high proteins foods aren’t so easy to come by because of the concern that cats are overweight. A high protein food will help your cat retain and build lean muscle. Even if your cat is underweight, you’ll want your cat to build lean muscle rather than fat. Additionally, high-calorie options will help your cat have the energy to burn. Underweight cats are often very active, which means that they probably burn off far more than what they consume. High-calorie foods will be sure to help them refuel and stay active. When you are looking at high-calorie options though you still need to avoid heavy starches that will lower your cat’s energy! It’s a slippery slope, feeding cats. Wet food is the best way to keep your cat hydrated and underweight cats are often dehydrated. Although you might not want to remove kibble from their diet completely, wet cat food can help keep your cat interested in their meals. Cats are well-known as picky eaters, and if you can isn’t interested in food, you might have to try out a few things before you find something they like. The wet food’s moisture may even entice your cat to eat more often because they can digest the wet cat food more quickly. Kibble will often sit heavily in your cat’s stomach making them feel full for much longer during the day. Wet cat food that digests quickly will have your cat more aware of their hunger. For high-calorie wet foods look for high-protein formulas. Wet cat foods will usually have more options in proteins because they are made into a pate rather than dehydrated. But, dry cat food has a lot to offer too, and the choice between wet and dry cat food is up to you. You can decide whether the moisture in wet food or the protein-packed dry food is the best option. With dry food, you will easily find much higher levels of protein, fat, and fiber. Not to mention that many kibble options are more nutrient dense when it comes to fatty acids, essential vitamins and minerals too. Although we try to ensure that our tips in finding a great value line up together, free feeding only works with dry food. If you leave wet cat food out all day, it will get gross, dry out and attack insects. So, if you’ve chosen dry cat food as your primary pet food of choice, you will want to give free feeding a shot. Many pet parents have heard that free feeding should be discouraged, and you shouldn’t leave bowls of food down overnight. Regular feeding schedules have their perks, but if your cat is underweight, they may be a shy eater. Many cats will not eat when someone is around. This weird cat behavior goes into their wild roots where they would only eat in moments of safety. Your cat may feel like they’re not safe or that you’re going to try to touch them while they eat. Free feeding allows your cat to have the opportunity to eat in peace. Merricks is a great brand for wet cat food, and they offer outstanding benefits with this formula for cats that need to gain weight. With a 10% protein, and 5% fat this combination is one of the best you’ll see in a wet cat food option. Merrick uses high-quality deboned chicken, with organic alfalfa in a chicken gravy. The pate is nutrient dense and balanced for growing kittens and cats that need to gain weight. We like that the first ingredient is a high-quality deboned chicken. Unlike other options that use a chicken meal or by-product, Merrick has stuck by their guns and refused to use subpar ingredients. We don’t like that Merrick uses more supplements to fill in nutritional gaps rather than diversifying their ingredients list. Rather than using whole foods, they opted for supplements in this recipe. 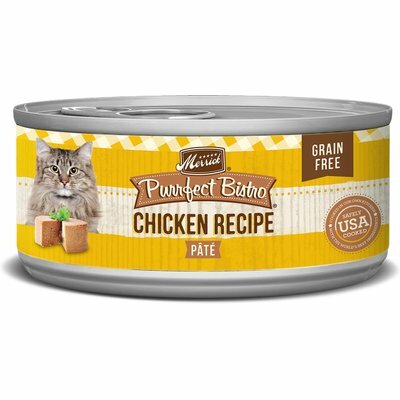 Your cat is still getting all the nutrition they need from Merricks Purrfect Bistro Grain-Free Chicken Pate Canned Cat Food even though they’re using supplements. Merrick gives us a high-quality single sourced protein cat food option. To help your cat gain weight, this recipe is high-calorie and high protein. Additionally, it is grain free and will settle easily on your cats’ stomach. The high moisture content should allow your cat to feel the difference between when they’re full and hungry. 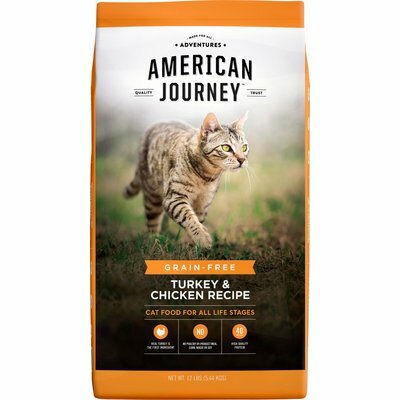 American Journey models their recipes after a cat’s natural diet which is high in protein and high in calories. This formula blends turkey and chicken with peas, flaxseed, and a wide variety of fruits and vegetables for a well-rounded diet. We like that the fat percentage is high, but the ingredients show that the fat itself comes from chicken, pumpkin, blueberries, and cranberries. When a cat needs to gain weight, you don’t want the fat percentage to come from by-products or grains. There is no downside here, although there’s a lot of supplements in this formula they made an effort to source their nutrition from whole foods. The moisture of 10% might not be great for the cat to know the difference between full and hungry if they are a disinterested eater. American Journey started out with limited ingredient recipes, and while they’ve expanded on their ingredients list a bit, they kept their idea of quality. American Journey isn’t about by-products and artificial colors and flavors. Instead, they provide tasty ingredients that are nutrient dense and high quality! The better bonus here is that even picky eaters have been known to show interest in American Journey recipes. We believe it’s their easy on the stomach ingredients and tasty fillers such as pea fiber and fish meal. This option from BFF really stands out for the picky eating cats. Flavors include tuna and chicken, tuna and beef, tuna and salmon, tuna and lamb, tuna and turkey and tuna and duck. Each of these flavors delivers about 9% protein and very low-fat contents. We love the variety of flavors and ingredients. None of these formulas use any by-products, and they focus on using only high-quality ingredients. The pricing structure is a bit off here because at first, it seems like you’re getting a great deal, I mean, 12 packs of food for just over a dollar each! But, when you figure that each pouch is only 3-ounces and that your cat should be eating 2-4 of these a day, the price skyrockets. If BFF is in your budget, you should definitely give this variety pack a shot. The various flavors can help encourage a picky eater to try something new until you find out what they like and will eat regularly. The formulas are low calorie and low fat. But, if your cat’s underweight issue stems from them not wanting to eat, then you don’t have to worry about the formula being low fat or low calorie. With four different varieties in this pack, even a picky eater can find something they like. The benefit of using a variety pack with an underweight cat is that you can test out different things and determine if their picky eating is affecting their weight. Weruva isn’t a well-known brand, but they are premium and use ingredients of only outstanding quality! 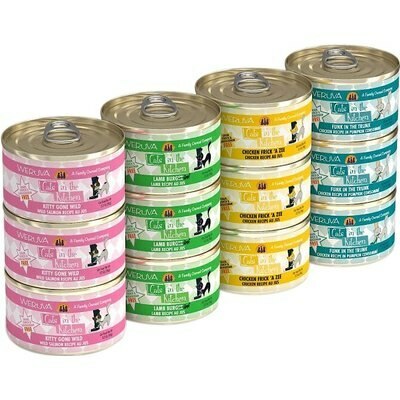 Each recipe in this variety pack has about 10% protein which is exceptionally high for wet cat food. Unlike dry cat food, a wet cat food can’t possibly reach the 30% goals that many pet owners look for, instead of wet food with a lot of protein will usually have between 9 and 13% crude protein. We don’t like that these cat food options are such a low calorie. As we mentioned before, your underweight cat needs everything that they can get, including calories. From Funk in the Trunk to Chicken Frick ‘A Zee, these flavor varieties will entice your cat to eat more and keep them interested in meals. 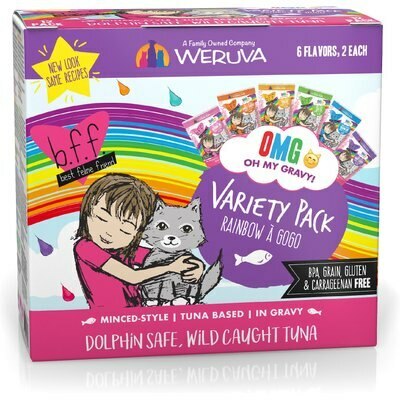 But, take great caution when you’ve switched them over to this wet food option from Weruva. You’ll want to ensure that your cat is getting the chance to eat enough because of the low-calorie formulas. Weruva is a great choice for any underweight and lazy cat. They’ll be happy to chow down on these recipes and hopefully gain a little weight too! Blue Buffalo stands out as the premium cat food brand that’s available anywhere. Chewy.com makes it easy to set up a subscription for reorders though which makes using a priced premium brand even better. These formulas are all in pate form, so they have a lot of moisture, and fortunately a lot of protein too. Blue Buffalo has learned from their past mistakes and actively avoid any by-product. Now the first ingredient of any of these recipes is the primary protein which includes duck, chicken, and salmon. There’s nothing to dislike here! Although we prefer the 5-oz cans, if your cat is underweight they may not be up to the task of eating 5-ounces every meal period. Blue Buffalo helps promote healthy eating habits with their choice of a 3-oz can. Whether it’s chicken, duck or fish your cat will find the variety and wholesome ingredients a bit more enticing than kibble. Additionally, Blue Buffalo leaves out the ingredients that don’t provide valuable nutrients to your cat’s diet. There are no artificial preservatives, flavors or coloring additives that can dissuade some cats from eating. Instead, Blue Buffalo uses high-quality proteins and vegetables such as sweet potato and carrots in their formulas! 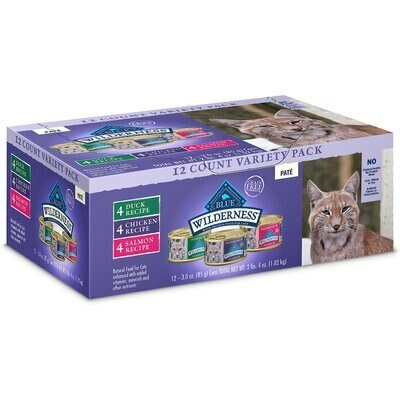 Without a doubt, the Blue Buffalo Wilderness Pate Variety Pack has everything that your cat will need to gain weight at a healthy pace. Their formulas are all high-protein and high-calorie which the big ticket item in is helping your cat gain weight. Additionally, the proteins here are all lean proteins that your cat can quickly turn into muscle mass rather than stores of fat. But finally, what sealed the deal and made this variety pack, or really any option in it, the top choice for the best cat food for underweight cats is the moisture. There are other wet cat food options available, but this one doesn’t lose the high protein percentage to make way for moisture. The balance in this recipe makes it the greatest choice out of our top 5 for helping your cat gain weight.